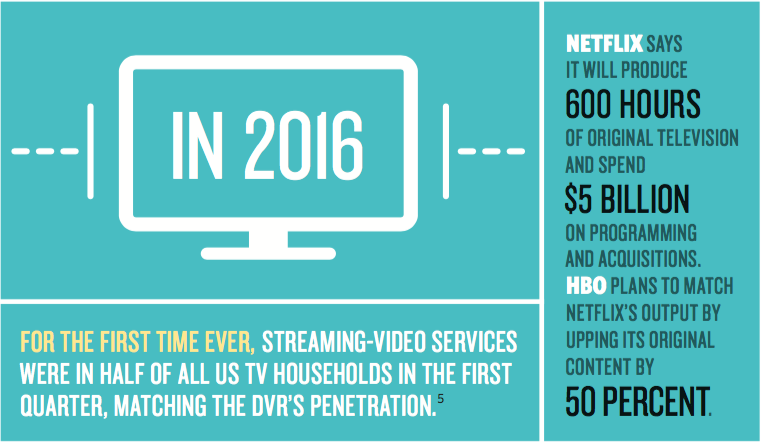 With consumers becoming increasingly untethered from their cable providers, networks reinvent the viewer experience. 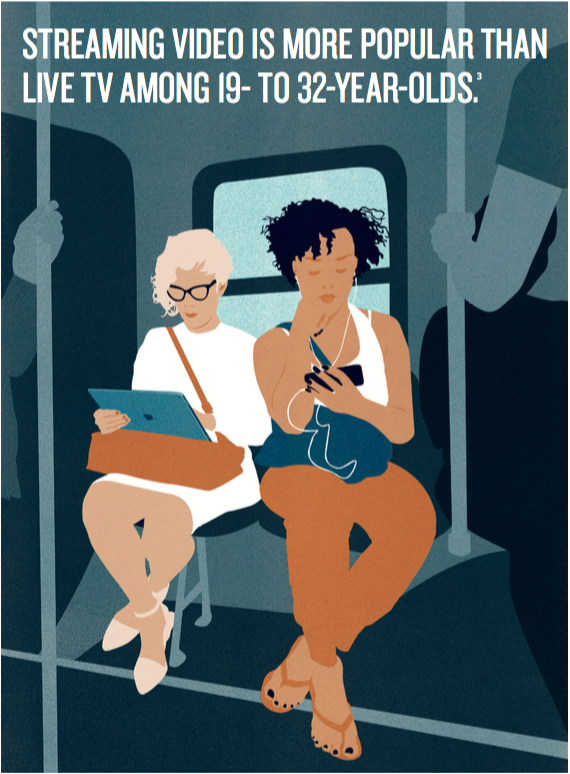 In March 1946, when the New York Times called television “a lusty infant now struggling to take its place among the arts and sciences,” it could never have imagined the ways in which people would, just decades later, consume this new medium: on laptops, tablets, and smartphones; on trains, in coffee shops — even walking down the street. Digital technology has brought sweeping changes to the when, where, and how of watching TV, which in turn has given rise to an abundance of content. The last 10 years have seen the proliferation of media companies producing content for consumption both inside and outside the traditional cable-provider model. Viewers now have more choices to make — and can select from among higher-quality content — than ever before. But with these drastic changes come new challenges for content creators and traditional media companies alike, all of whom are grappling with how to set themselves apart in an ever-expanding sea of competition. By offering streaming service beginning in 2007 and releasing entire seasons at once, Netflix was the first to feed viewers’ previously untapped desire to watch their favorite shows in uninterrupted, hours-long benders. Like so many new digital providers, Netflix does it all. The company not only provides access to movies and shows created by traditional studios and channels, but also increasingly produces original content. In doing so, Netflix is a prime example of the blurring lines between those that have direct relationships with consumers — cable and satellite companies that act as distributors of content in the form of bundles — and those that aggregate or actually create content. What exactly is a bundle? Knee says there are several types, often confused. The basic package of channels that cable companies provide to subscribers is the bundle most consumers think of first. The distributors are just reselling channels that the large entertainment conglomerates, such as 21st Century Fox, sell to the cable companies in bunches; they insist that all of their channels be included in what operators offer. “That still constitutes the vast majority of the profits for old-fashioned media conglomerates,” Knee says. But while profitable for both conglomerates and cable companies, bundling forces consumers to pay for scores of channels they don’t watch when all they really want to see, for example, is Chopped on the Food Network. Another type refers to the various entertainment content presented under the banner of one channel or brand; for instance, AMC’s or TNT’s lineup of shows is its respective bundle. These are typically a mix of original and purchased content. All forms of bundling are under stress for various reasons — and to the detriment of the old players. Pew Research Center data suggests that as of 2015, 15 percent of Americans had cut their cable service, while another 9 percent had never had a cable or satellite subscription, whether by choice or due to lack of access — meaning nearly a quarter of Americans currently have no traditional cable connection. The cord cutters overwhelmingly cited cheaper access to content via digital providers such as Netflix, Hulu, or Amazon Prime as the primary reason for forgoing a cable or satellite subscription. The preference is further defined by generation, with young adults in the 18- to 29-year-old demographic the most likely to be entertainment free agents. “The implications of this [change] are bad for the incumbent aggregators and distributors who benefited from the previous organization of the entertainment ecosystem,” Knee says. “But they are very good for consumers, who have the opportunity to consume in different ways and at different price points than they used to.” In other words, consumers are no longer beholden to the cable company’s predetermined package of products. They can spend as much or as little as they choose and only pay for exactly what they want, downloading or streaming anything from a single episode to the entire season of their favorite shows. Delivering consumers their hearts’ desires is driving innovation by creators, according to Nora Ryan ’81, executive vice president and chief of staff for Epix network and a 35-year TV-industry veteran. “We’re in a new golden age of television,” Ryan says. “Whether you’re cable, satellite, or a new digital provider, there’s no reason why you can’t be playing the game. You’ve just got to be smart, adaptable, and able to give consumers what they want: great programming that is available to them whenever, however they want it.” Ryan points to the plethora of high-quality shows that have risen from the injection of competition in the field, such as Netflix’s most-watched original series Orange Is the New Black, which in 2014 was among the first non-network series to win Emmy Awards, and Amazon’s critically acclaimed Transparent, which is credited with helping to make transgender rights a mainstream social issue. Fahey agrees that audiences are demanding higher-quality content — and also believes that millennials’ viewing habits are different from those of their Generation X and baby boomer counterparts. With Oscar-winning director Spike Jonze as co-president, Viceland offers content geared specifically toward millennials. States of Undress, for example, focuses on fashion in places typically ignored by the fashion world, such as Pakistan or Venezuela. Viceland’s Gaycation, recently nominated for an Emmy, features actress Ellen Page exploring LGBTQ cultures in locations like Brazil and Japan. Viceland is available as a cable channel and also offers its content to cable subscribers on its website and multiplatform apps. But another content creator, Jon Steinberg ’03, is skipping the traditional cable model entirely. The former president and COO of BuzzFeed, which attracts more than 7 billion views each month, and former CEO of the Daily Mail’s North American operations, has crossed into video content with Cheddar. Launched in May, Cheddar is a live and on-demand video news network broadcast daily from the floor of the New York Stock Exchange, featuring CEO and startup-founder interviews, as well as technology, fashion, and media coverage, all targeted toward twenty- and thirtysomethings. The content is available on Cheddar’s website for a monthly fee of $6.99 and via video sites like Facebook Live, Amazon Video, and Vimeo. The live aspect, in particular, sets Cheddar apart from a lot of other digital media. For the existing media conglomerates, though, moving from their traditional profit model—which includes traditional advertising—presents a major challenge in adapting to the digital environment. Enter Dan Riess ’01, executive vice president of content partnerships and co-head of Turner Ignite, a Spectrum company that manages a portfolio of more than 100 brands and content in 200 countries, including popular cable channels Adult Swim, CNN, NBA TV, and TNT, and multiple digital properties. Riess is responsible for creating advertisements that are anything but the traditional 30-second commercial, like product placements and other alternatives. And evolve she did. Ryan quickly moved up the ranks in marketing and landed at the premium channel Showtime, where she spent more than a decade in charge of marketing and business development and helped create Showtime On Demand, a foreign concept when she began researching the idea in the early 1990s. (The service launched in 2002.) She then headed a joint venture with Robert Redford and his Sundance Institute to launch the Sundance Channel, which offered viewers critically acclaimed films and series first on satellite, then on cable. Next, Ryan served as general manager of Fuse/MuchMusic USA and VOOM HD, developing a suite of 21 high-definition channels across a broad spectrum of genres and audiences. She joined the new premium channel Epix as it launched in 2009. Ryan sees many of today’s digital options as simply the next phase in TV evolution, and recognizes in the current upheaval many parallels with cable’s early years. 1. “The Digital Future of TV Networks & the Original Series Crunch.” REDEF, Feb. 5, 2015. 2. “TV Share of Clock.” GFK MRI, Aug. 7, 2015. 3. “Digital Democracy Survey.” Deloitte Development, 2016. 4. “Americans Cutting the Cable TV Cord at Increasing Pace.” eMarketer, Dec. 10, 2015. 5. “Total Audience Report.” The Nielsen Company, June 2016. 6. “HBO plans to match Netflix’s 600 hours of original programming.” MarketWatch, March 8, 2016.